You can find out more details about the new Bugatti Chiron Sport '110 ans Bugatti over at Bugatti at the link below. The flag originally symbolised the union between monarch and people in the phase of the constitutional monarchy. Even the underside of the Chiron's movable rear wing has been finished à la the Tricolour. The colors are shown as a mirror image on the right-hand side of the vehicle, matching French official vehicles. The body of this Chiron is predominantly blue carbon fibre. The matte Steel Blue paintwork at the rear of the auto, produced in a complex process, has a sheen like hot-rolled steel. Other areas like the Bugatti line and the "C structure" surrounding the passenger compartment are also painted Steel Blue. The front end consists of exposed carbon fibre in Steel Blue Carbon, once again a matte colour suggestive of steel. The rest is painted in matt "Steel Blue" said to be reminiscent of Bugatti's historic models, and paired with matt "Nocturne" black wheels and French Racing Blue brake calipers. To obtain an immaculate finish, the aluminium filler cap is sandblasted and hand-polished. 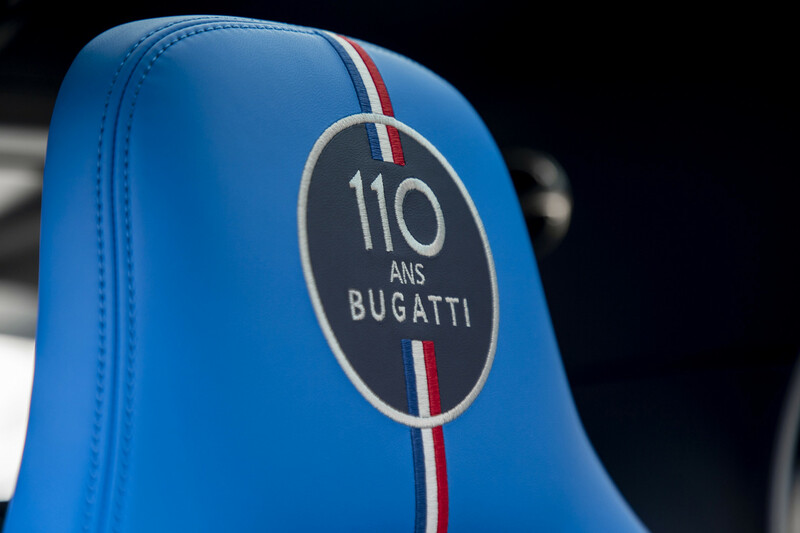 As you might have gathered from the name, it's an anniversary special, celebrating the passing of 110 years since the Type 10, Ettore Bugatti's first ever auto. The rear of the vehicle is finished in matte Steel Blue paintwork (contrasting with the matte black exhaust system), with the "C" shaped element surrounding the passenger compartment painted in the same hue. The matt black exhaust system sits in contrast. It's done in the same deep blue as the exterior, broken by a tri-color stripe running down the center of each seat and a small French flag on the steering wheel. The sports steering wheel combines matte carbon-fibre with a blue leather cover. There is a solid silver crafted medallion which is positioned on a carbon fiber plate in the central console stowage space. Hyper sports cars have been a Bugatti tradition since the establishment of the brand - they are part of Bugatti's DNA. In 1909, Bugatti founder Ettore Bugatti unveiled his first ever model, the Type 10. Only 20 units will be made available in the market. This new edition is based on the mighty Chiron Sport, offering a handling upgrade of the regular ho-hum Chiron. Hence, it is powered with 8.0 liter quad-turbo W16 engine that offers an output of 1,479hp (1,500PS / 1,103kW) and 1,600Nm of peak torque. As expected, the headrests have "110 Ans" signage.